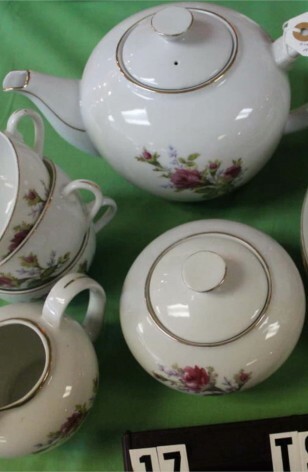 Vintage - Fine China of Japan, Moss Rose Pattern, Made in Japan from the 1940's to the 1950's - Total of (17) Pieces. Really nice Moss Rose Pattern by Fine China of Japan. It is a Smooth Plain-Cut Pattern with Beautiful Red Roses, Sage Green Leaves and 22kt Gold Trim on Rims. Shape of Tea Pot, Sugar Bowl and Creamer, has the more modern lines, which fits with the 1950's "Less is More" thinking. You'll love it as a Service for Four. 4 - Saucers - 5 3/8"
4 - Bread/Dessert/Tea Plates - 7 1/4"